Today was my son's 2 year old birthday! My sweet baby is growing up and I wanted to make him a cake. I chose to make a carrot cake with cream cheese frosting and a number 2 sprinkle decoration. 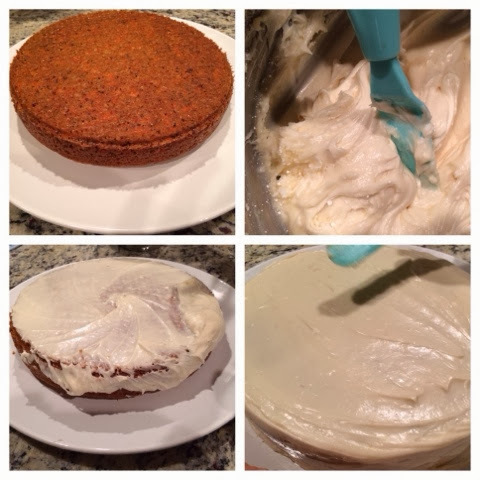 My all time favorite carrot cake recipe that turns out fantastic every single time is as follows. In mixer, mix together first 6 ingredients. Then add in the next 4 ingredients in that order. Turn batter into a greased 9x13 baking pan or two 9' circular baking pans. Bake for 30 mins @ 325f or until done. Frost when cake is cooled. I removed my cake from the oven to let cool. When I was able to touch the sides without burning myself, I released the spring and flipped my circular cake onto a platter. Then I placed the platter into the fridge for about 15 minutes before frosting it. Today, I decided to use an offset frosting spatula to spread my cream cheese frosting to give it a more flat and finished look. Starting from the top middle I spread out the frosting then worked my way around the sides. 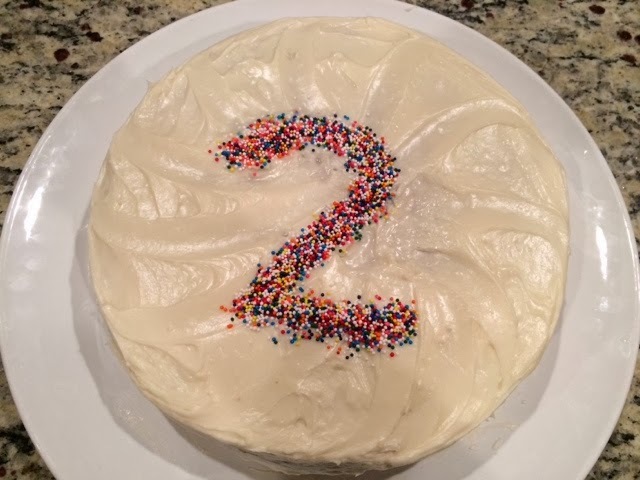 Next, I wrote the number 2 with decorating icing gel. Then I used my fingers to pick up colored sprinkles and repeated this until it covered the icing gel. Plop on two candles and we were set to sing Happy Birthday! I think this cake turned out quite well considering it was my first time using the sprinkles this way and my sweet little boy loved it too! The best part, it was surprisingly easy. I should have baked this earlier in the day but I ended up starting this when I started making dinner. All in all if I have to guess, I'd say it took just over an hour.